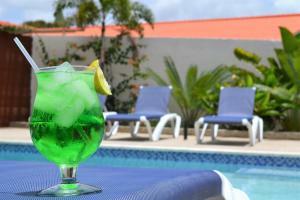 ﻿ Best Price on Bayside Boutique Hotel in Willemstad + Reviews! Bayside Boutique Hotel is located on the Blue Bay Golf & Beach Resort and all guests enjoy complimentary access to the 18-hole golf court with no green fee charges. Additional amenities include an outdoor pool, sun terrace and free WiFi. The closest beach is only a minute's walk away. A flat-screen TV and a seating area are standard in every room. Some Bayside Boutique Hotel rooms have a sea view. A restaurant, fitness center, tour desk, and luggage storage are offered on site. Water sports facilities are available to all guests throughout their stay. Willemstad center is less than a 10-minutes drive away while the hotel is 10-minutes' drive from Curaçao International Airport.